DiseaseLand is a disease genomics database and visualization software that helps users explore public and private genomics datasets using its "Land” technology, allowing researches to more readily power their research. DiseaseLand focuses on datasets of common genetic disease including but not limited to immunological diseases, metabolic diseases and cardiovascular diseases. 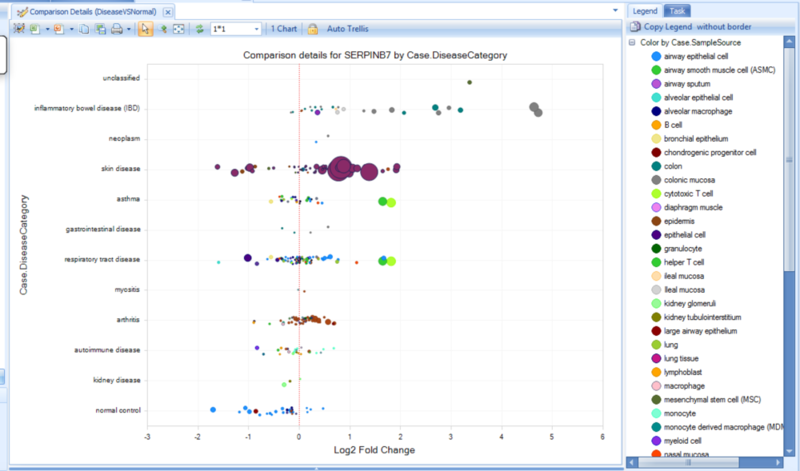 All datasets have been curated as belonging to different "Comparison Types", including Treated vs Control (shown here). Treatments have been carefully curated using a set of controlled vocabulary, allowing for visualizations like this one, showing fold changes (sized by p-value) for each treatment. Comparisons have further been curated with cell type, allowing the user to quickly filter to cell types of interest. 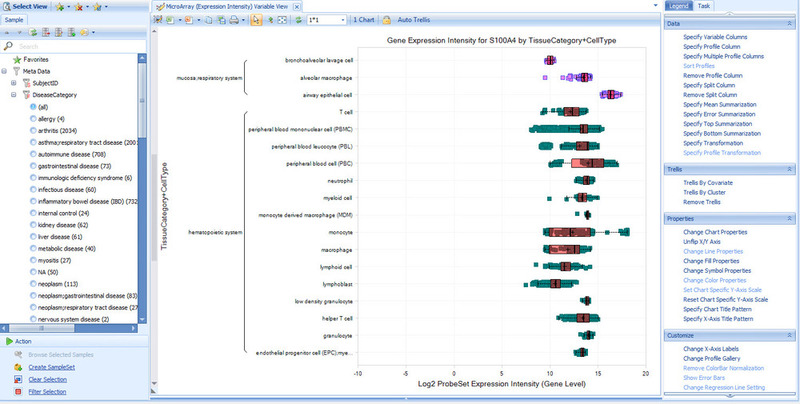 Shows the expression intensity categorized by cell type and tissue category. 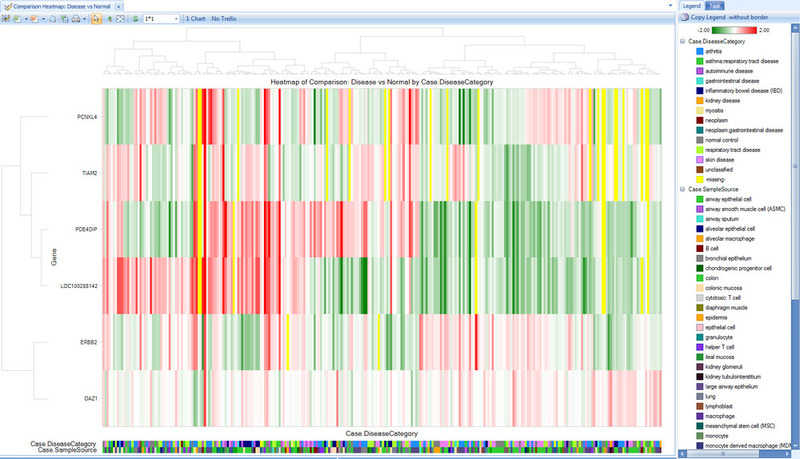 Shows the gene expression heatmap of a set of gene of interest, labeled by disease category and sample source. Blueprint datasets focus on epigenetic maps of distinct types of haematopoietic cells from healthy individuals and on their malignant leukaemic counterparts. SERPINB7 is found to be upregulated in skin disease and IBD. Experimental designs in projects within DiseaseLand are quite different, and batch effects in microarray projects are difficult to remove. Omicsoft created project-specific views to display expression values based on experiment design in each project. DiseaseLand is a genomics database and visualization software that helps users explore public and private genomics datasets using its "Land” technology, allowing researches to more readily power their research. DiseaseLand focuses on datasets of common genetic disease including but not limited to immunological diseases, neurological disorders, metabolic diseases and cardiovascular diseases. It is an upgrade offering for ImmunoLand and CVMLand, Omicsoft's previous Land products. DiseaseLand offers the potential to look at gene expression, all processed through the same pipeline, across many different projects, offering additional value, including exon level expression and alternative splicing calculations. Users can add their own collection of data into the database, and it is all hosted at the customer's site for complete data privacy. Data has carefully curated and incorporated from GEO (Gene Expression Omnibus), SRA (Sequence Read Archive), ArrayExpress, and more. Advances in single-cell sequencing approaches enable Omicsoft to study differences between cell types and subpopulations, at the level of the genome, transcriptome and epigenome. Single-cell technologies are used to study diverse areas of biology and disease, such as development, microbial population composition, and cancer evolution. In mid-2016, we released a Single Cell Collection, focusing on single cell projects published in the GEO repository. Gene Set Analysis is a powerful tool to help users who have their own gene signatures and would like to identify comparisons containing similar gene set enrichment from both tens of thousands of comparisons in the Lands as well as customer gene sets for on-premises customers. [Feature Review] Save Customized Views for Future Usage and Sharing through in the "Lands"